We all love instant gratification projects. Okay, no beadwork is instantly gratifying, but these come close. You can sit down and finish one of these in fifteen minutes -- less for you quick stitchers. These little beaded beads are also just plain fun. 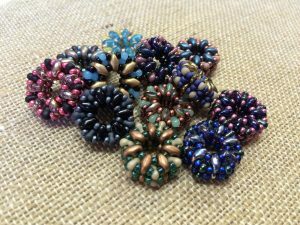 Turn them into earrings or string a bunch of them onto leather for a necklace that will go with any and everything in your closet. Heck, just put them in a bowl and admire them. Promise you won't be able to stitch just one. Staff instructor is Michelle. Supplies are not included in the cost of the class.